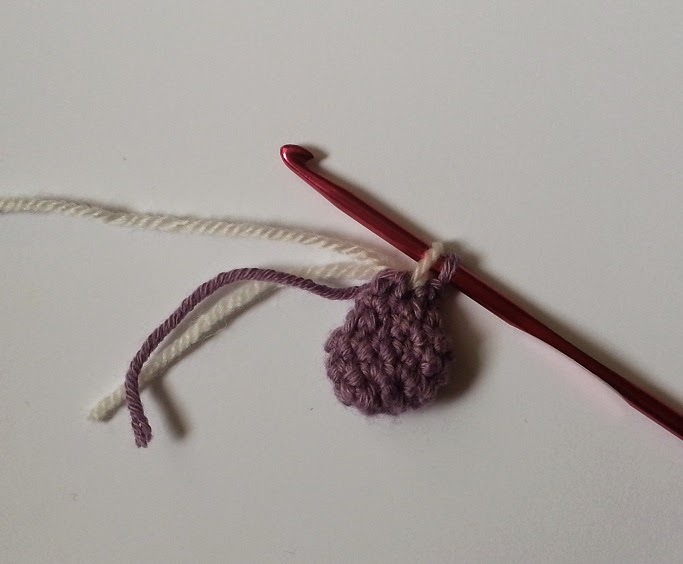 I used a 4mm hook as I have a tight tension, however if you crochet on the looser side, use a 3.5 mm hook. A small amount of pink embroidery thread for the mouth. This pattern is written in UK crochet terms, stitches used are: Chain, Double Crochet (DC), DC decrease, Magic ring and slip stitch. 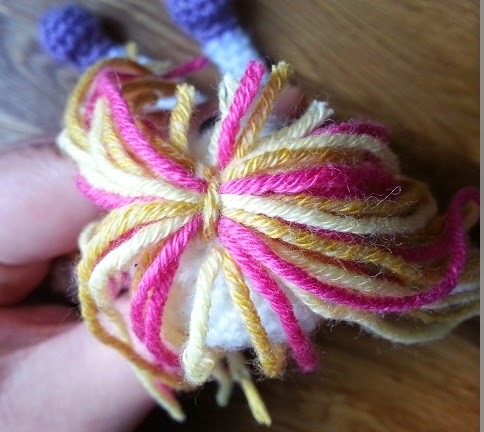 The Dolly is made in continuous rounds, you may need to use a stitch marker to mark the start of each round. When joining a new colour, draw up a loop of the new colour in the next stitch and continue crocheting (this is explained in more detail later in the pattern). The method used for the DC decrease is Invisible Decrease. To do this insert your hook under the front loop of the next stitch, now insert your hook under the front loop of the next stitch, yarn over and through all 3 loops on your hook. The number of stitches in each round is in brackets at the end of each line of instructions for ease of reference. It is important to read the full instructions for the round you are working on before you start the round. Round 1: Using the colour you want for the shoes of your Dolly, Make a Magic Ring, Chain 1 and 6 DC into the ring. Pull the ring closed. Round 2: 2 DC in each stitch around (12 stitches). Rounds 3 and 4: 1 DC in each stitch around (12 stitches). Round 5: DC decrease 6 times (6 stitches). Round 6: 1 DC in each stitch around (6 stitches). Poke the tail end of the Magic Ring into the foot. 1 DC in each stitch around. After you have made the first DC cut the yarn used for the shoe leaving a tail end. It is important to crochet over the tail ends for a couple of stitches to secure them as you will not be able to sew them in later. (6 stitches). Rounds 8 - 16: 1 DC in each stitch around (6 Stitches). 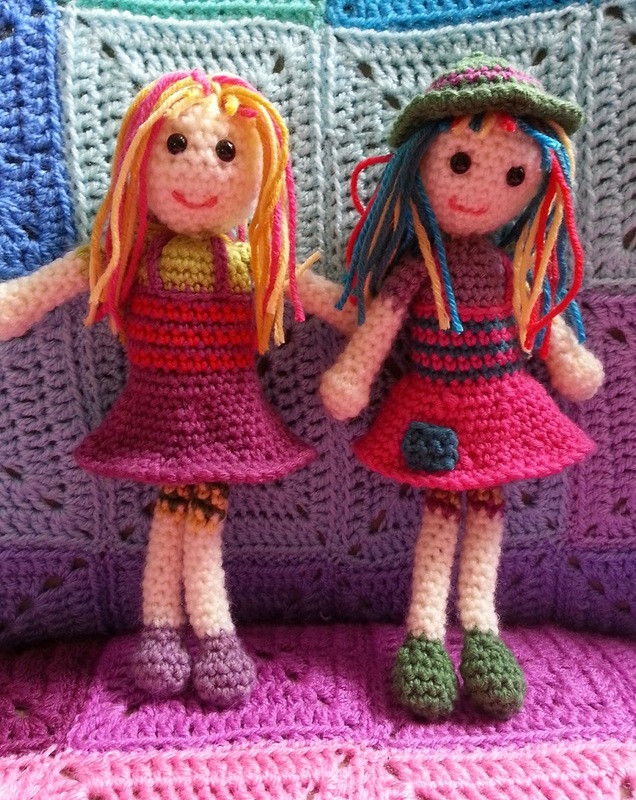 The next part of the pattern is Dolly's draws, these are made in stripes so you will need two different colours. The stripes are made in a continuous spiral, when you start using the next colour of the stripes, move your first colour to the back of the work so it is out of the way, carry on crocheting with the next colour. Round 17: Join your first colour, 1 DC in each stitch around. Do not fasten off. After you have made the first DC of this round cut the yarn used for the skin colour leaving a tail end. Crochet over this tail end for the next couple of stitches. (6 Stitches). Round 18: Join your second colour, 1 DC in each stitch around. Do not fasten off (6 Stitches). 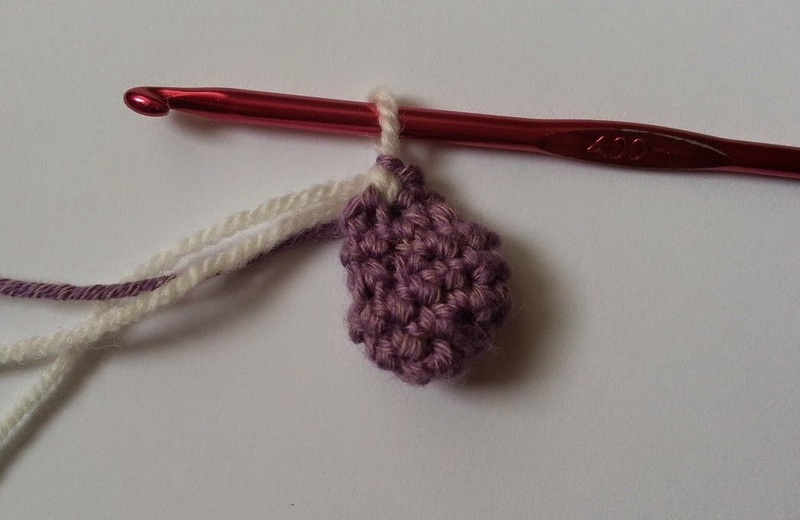 Round 19: Pick up the first colour and start crocheting with it, 1 DC in each stitch around. Do not fasten off (6 Stitches). Round 20: Pick up the second colour and start crocheting with it, 1 DC in each stitch around. Do not fasten off (6 Stitches). Rounds 21 - 23: Pick up the next colour and start crocheting with it, 1 DC in each stitch around. Fasten off the yarn and poke all the tail ends down into the leg (6 stitches). Make a second leg but do not fasten off the yarn at the end as we will continue using these two colours for the rest of Dolly's draws. Round 1: With the second leg you have made, change to the next colour of your stripes and 1 DC in the next 3 stitches. Now pick up the other leg and starting in the stitch immediately to the left of the last stitch made on this leg, 1 DC in the next 6 stitches (this brings you all the way around the top of the leg). 1 DC in the next 3 stitches of the other leg (the one you started with) to complete the round. Do not fasten off the yarn (12 stitches). Round 2: Pick up the next colour and 2 DC in each stitch around (24 stitches). Round 3: Pick up the next colour and 1 DC in each stitch around (24 stitches). Round 4: Pick up the next colour and 1 DC in each stitch around (24 stitches). Round 5: Pick up the next colour and 1 DC in each stitch around. After you have made the first DC of this round cut the yarn used for the previous stripe leaving a tail end. Crochet over this tail end for the next couple of stitches (24 stitches). Fasten off. The legs and bottom of Dolly's body are now made. Put this piece to one side as we must now make Dolly's skirt. Row 1: Using the colour that you have chosen for the skirt, Chain 43. Starting in the second chain from your hook, 1 DC in each stitch along (42 stitches). Round 2: Bring the end of the row around so you can start crocheting in a round, around the skirt in a continuous spiral. Your next stitch will therefore be made in the very first DC that you made in Row 1. 1 DC in each stitch around (42 stitches). Round 3: *1 DC in next 5 stitches, DC Decrease* repeat this 6 times (36 stitches). Round 4 - 6: 1 DC in each stitch around (36 stitches). Round 7: *1 DC in next 4 stitches, DC decrease* repeat this 6 times (30 stitches). Round 8: *1 DC in next 3 stitches, DC decrease* repeat this 6 times (24 stitches). Round 9: 1 DC in each stitch around. Do not fasten off (24 stitches). The skirt is now made. In the next round of the pattern we attach the skirt to the body so push Dolly's legs down into the skirt so that the top of the skirt lines up with the top of the legs/body piece. The next 7 rounds are made in a spiral (the same way as Dolly's draws were made). The first colour you use in this spiral/stripe sequence will be the same colour that the skirt is made in, use a second colour for the contrasting stripe. Round 1: In this round your hook must go through both loops of the skirt piece and the front loop only of the legs/body piece. Make sure the legs/body piece is lined up with the skirt piece before you start so that the first DC you make in this round goes in the next stitch of the skirt and the next stitch of the legs/body piece (i.e. in the stitch immediately after the last stitch you made on the legs/body piece). It is important to try to crochet over the tail ends of the legs/body piece for a few stitches to secure the yarn. 1 DC in each stitch around. Do not fasten off (24 stitches). Round 2: Join your second colour, 1 DC in each stitch around. Do not fasten of (24 stitches). Round 3- 6: Pick up the next colour and 1 DC in each stitch around (24 stitches). Round 7: Pick up the next colour and 1 DC in each stitch around. After you have made the first DC of this round cut the yarn used for the previous stripe leaving a tail end. Crochet over this tail end for the next couple of stitches. (24 stitches). Round 8: The next 6 rounds are Dolly's T-shirt so choose a new colour for this. In back loops only, 1 DC in each stitch around. After you have made the first DC of this round cut the yarn used for the last stripe leaving a tail end. Crochet over this tail end for the next couple of stitches. (24 stitches). Round 9 - 11: 1 DC in each stitch around (24 stitches). Round 12: DC decrease around (12 stitches). Stuff the body. Round 13: DC decrease around (6 stitches). Fasten off your yarn leaving a long enough tail end to sew a couple of stitches at the top of the body to close the round. That is Dolly's body made! At this point sew in the tail end of Dolly's skirt neatly to secure it. Round 1: Using the skin colour that you used for the legs: Make a Magic Ring, Chain 1 and 6 DC into the ring. Pull the ring closed (6 stitches). Round 3: 1 DC in each stitch around (12 stitches). Round 4: DC decrease around (6 stitches). Round 5 - 10: 1 DC in each stitch around (6 stitches). 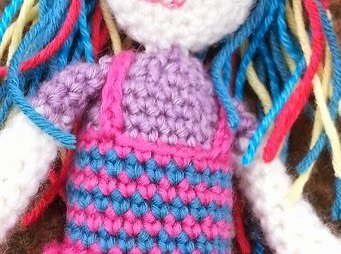 Round 11: Join the colour used for Dolly's T-Shirt, 1 DC in each stitch around. After you have made the first DC of this round cut the yarn used for the skin colour leaving a tail end. Crochet over this tail end for the next couple of stitches. (6 stitches). Round 12- 15: 1 DC in each stitch around (6 stitches). 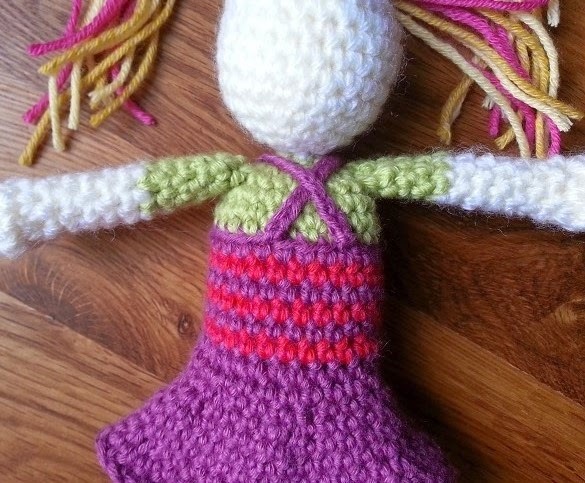 Fasten off and sew the arms onto the body. Round 1: Using the skin colour, make a Magic Ring, Chain 1 and 6 DC into the ring. Pull the ring closed. Round 3: *1 DC in next stitch, 2 DC in next stitch* repeat this 6 times (18 stitches). Round 4: * 1 DC in each of the next 2 stitches, 2 DC in next stitch* repeat this 6 times (24 stitches). Rounds 5 - 10: 1 DC in each stitch around (24 stitches). Round 11: *1 DC in each of the next 2 stitches, DC decrease* repeat this 6 times (18 stitches). Round 12: *1 DC in next stitch, DC decrease* repeat this 6 times (12 stitches). Now attach the safety eyes and stuff the head. Round 13: DC decrease 6 times. Fasten off. Make a couple of stitches at the top of the head to close the small gap. Sew the head on to the body. The straps should pass over the shoulders and cross at the back like this: Sew them in place. To make Dolly's hair, I cut several lengths of different coloured yarns, took a separate length of yarn and tied a knot around the middle of the lengths of yarn. I then sewed this on to the top of Dolly's head. I did the same with shorter lengths to make Dolly's fringe. I added a pocket to the skirt of my first Dolly, to do this I chained 3, 1 DC in second chain from my hook, 1 DC in next chain. Chain 1, turn. 1 DC in next 2 stitches. Chain ,1 turn. 1 DC in next two stitches. Fasten off and sew the pocket onto the skirt. Thank you for sharing this sweet doll. Will give her a try! Lovely pattern. Can't wait to make one! Thank you.